1. Any debate about the current struggle between electronic and traditional print publishing begins with this fact: no one thinks that online publishing will not eventually overtake the traditional, hold-in-your-hand, made-of-dead-trees model. While you may well continue to be able to slip something paperback-sized into your back pocket two decades down the line, we all know that the odds are that it won’t be made of paper. Those thinking that they can successfully continue with a traditional model of publishing for an unlimited time are as delusive as a historical Luddite thinking a solid sledgehammer blow capable of holding back the forces of industrialization. It is human nature to yearn for next year’s model. We are clever monkeys – we tweak, we twiddle, and of such moments Progress is made. Accordingly, while the metaphor of the page will continue, I suspect, for centuries, the everyday object is doomed to be replaced — made obsolete within the next century. Books may survive, but in the form of curiosities rather than staples. 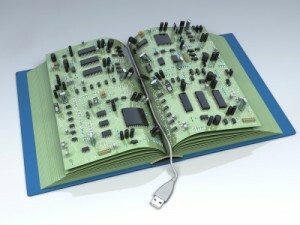 One by one, we’ll see the various manifestations of books challenged by electronic publishing in the coming years. Most will fall, while those that remain will most probably find themselves dramatically and irrevocably changed. Paper textbooks will be among the first to go — are in the process of doing so right now, in fact, and who, remembering the days of ten pound science texts, can not count that as progress? Children’s books, with their emphasis on texture and art, will last much longer. As for the common paperback, well — once the Sony BeachReader, which I’m sure is due out any day now in six waterproof colors, appears, vacation reading will shift dramatically. Those who claim that online publishing and its adherents are killing traditional publishing are being disingenuous, blaming the small mammals supplanting the dinosaurs for bringing them down. 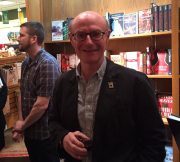 If anything, at the moment online publishing is helping traditional publishing by encouraging the love of reading that pulls one into a bricks and mortar bookstore. 2. Let’s look beyond the abstract to material circumstances, to a world, particularly an America, learning that unchecked consumption may not be possible going forward. Here’s a major reason why online publishing will overcome paper: electronic publishing requires less space and fewer trees. 30 million trees are consumed each year for books printed for US consumption alone. Similarly, as we move towards using less space, rather than more, which is preferable: the electronic device that holds five hundred books or those books, consuming precious cubic feet of storage? 3. Those who love the book in its traditional form, who relish the feel of pages bound in leather, the heft and smell and sound of paper pages, will always exist. However, as time passes, there will be fewer and fewer of them. Books in that form will become retro, vintage, classic, the form itself a semiotic marker for a particular lifestyle. 4. Text itself will probably survive. It is an extremely efficient means of delivering information, falling short only of beaming it directly into one’s brain (which I would also bet is coming at some point.) Beyond that efficiency, there is pleasure to consuming text, to soaking oneself in a dreamy bath of words or of listening to the cadences of well-constructed sentences. But text can be consumed as easily from a screen as from the page. 5. The issue of piracy has complicated discussions of electronic publishing. The ease of publishing electronically is both strength and weakness because it makes unauthorized reproduction easy as well. To my mind, it is the folk who follow the basic model of the Internet, the idea that information wants to flow, that it MUST flow, that will do the best in earning their living from it. The old model of handing someone a thing in return for money does not translate well in the world of electronic publishing. Some folks have taken to a model where work, distributed for free, drives up the sales of other words. This electronic exposure = sales model has worked well for some, such as Baen Books’ Eric Flint, author John Scalzi, and net advocate/writer Cory Doctorow. For them it’s worked; others have tried and not succeeded as well. The business model best suited to the Internet is still in the process of being discovered. We’ve seen ideas raised that include micropayments, donations, selling linked merchandise, advertising, subscriptions, syndication, and much more. This makes being an online publication interesting, but with electronic publishing it’s easy to change, to shift, to try new strategies, discarding the nonworking and embracing that which yields results. I suspect that any model will have to take the phenomenon of piracy as a given, and that models that incorporate and try to use it that will fare the best. But one important difference is that the story that, having been read, perhaps passed along to a couple of other readers, and finally ended up in the recycling bin, is gone. Meanwhile its counterpart on the web remains, continues drawing readers – and can still be accompanied by a working ad. 6. One of the things that changes the business model is that technology can add much to text, starting with presentation. Technology allows text to be tailored to the user. For example, an e-reader allowing the reader to zooming in on the text or adjusting the brightness so it can be read in sunlight. You can fiddle with the color of the page, or whether or not illustrations are displayed, or the type of font that is used. The reading can be tailored to the reader in a way that print publishing finds prohibitively expensive. 7. Technology can also add intertexuality to the text. Technology allows text to be accompanied by information that illustrates, explains, exemplifies. Not sure what that word means? Click on it to find out. Bring up a sidebar that explains the difference between guineas and pounds in James Joyce’s Ulysses, or a screen that lets you listen to it read aloud in the right accent. 8. Technology allows text to change and to do so as rapidly as human knowledge changes. Text can be updated to reflect current discoveries as quickly as they are made. Is a fact wrong? A reader can make a note of that fact and an editor correct it in the time it takes to fact-check and edit. As new texts are produced that may add to the understanding of the original one, it can be amended to point to them. While the fluidity of knowledge can be problematic, given the attempts of corporations and governments to control its manifestation on the internet, the vast number of readers makes it difficult for them to do so, as can be glimpsed in the daily struggles and fluctuations of Wikipedia. Text can be updated, edited, translated, illustrated, reproduced, transfigured, in an editor or publisher’s hands, in a place where anyone can be an editor or publisher. 9. The addition of community to the text creates powerful marketing possibilities. Impressed by a piece of writing and want to discuss it with other readers? Social networks such as GoodReads and LibraryThing make this possible, and amplify the power of word of mouth to sell books. Certainly this can be used to sell physical texts, but again, which recommendation is another reader likely to act on, one that forces them to the car in order to consume gas driving to the local mall or asks them to wait while their order is shipped to them, or the one that allows instant gratification with only a mouse-click? Online community allows one to find fellow readers who share a love of the most obscure text, and allows discoveries to be passed along with the knowledge of where to find them. With a global community of readers, publishing to niche markets becomes a more viable form of publishing, allowing a publisher to readily find the market/community suited to a specific genre, writer, or topic. Online magazines abound, including Clarkesworld, Strange Horizons, Fantasy Magazine, Abyss & Apex, and Beneath Ceaseless Skies. For them, selling advertising is a viable means of making money. This is particularly true since online content remains online. For example, at Fantasy Magazine we’ve got an article from 2008 that continues to gather a substantial number of hits each month. Furthermore, building community provides groups that may buy subscriptions, make donations, or otherwise financially support the publication, which is one of the reasons Fantasy Magazine has focused recently on social networks, such as Facebook, Twitter, Livejournal, and StumbleUpon. The future of publishing may well lie in the survival of such magazines. Online publishing has much to offer beyond the ability to change a font color or add a link, as it continues to grow into new forms. Interactive text, where reader and writer collaborate, or text which shifts randomly in accordance to algorithms buried in the page, texts that are games or directions or forms we haven’t begun to imagine yet, all lie before us. While books remain in our hands, the time may come when more and more of us are tempted to lay them down, at least part of the time, for the sparkly promise of electronic publication, an art form only just beginning to emerge. Cat Rambo lives and writes in the Pacific Northwest. Her collection, Eyes Like Sky And Coal And Moonlight, is an Endeavor Award finalist this year. Both it and The Surgeon’s Tale And Other Stories (with Jeff VanderMeer) are available on Amazon.com. 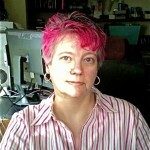 She is the fiction editor of Fantasy Magazine. Upcoming appearances include the Write on the River workshop, SteamCon and World Fantasy Con. Her website appears at http://www.kittywumpus.net. 1. Support the Obama administration’s initiative to mine those exotic elements at home. Yes, they exist, but not in the quantity that we can get from elsewhere. Didn’t know Obama was pushing this? Pay attention. And yes, support mining. Instead of cutting renewable trees, you’re supporting big, non-renewable, polluting holes in the ground all over the US. But that’s okay. You’re also supporting lots of power consumption too, and those trees will soak up a bit of the CO2. 2. Chew off your legislators’ ears DEMANDING that they get their lazy behinds in gear about sustainability standards, upgrading to smart infrastructure, and the like. After all, what good is your reader during the third day of a black-out? Or if we, like Iraq, only get power a few hours per day, and you need the energy for important things, like cooking and running the water pump? 3. Practice local storage. Every cloud server takes enormous amounts of power. Want your precious book on that? If you’re somewhere sunny, set up a local hard drive and some solar panels to run it from. That should be your library. Not GoogAmazCom. Don’t forget to replace it every five years, as the chips wear out. 4. Note to designers: the Sony BeachReader really should come with solar panels and/or a hand crank. Actually, every eReader should, but I guess that’s less convenient that turning the pages. As one of those crazy people who created what are, arguably, the first commercial ebooks (the Voyager Expanded Books, which debuted in 1992 on floppy disk), I find this essay fascinating, mostly because it parallels my thinking on the topic for the last two decades. I do, however, think that you are optimistic about ereaders that can stand up to the rigor of a day at the beach. The paper book, even cheap paperbacks, can be quite durable in adverse environments. Also, the paper book is wonderfully debugged technology with a very much longer shelf life than current digital standards can boast (the original Voyager ebooks are unreadable on today’s computers because the software no longer exists that can display them). Paper books have a huge cultural inertia that will be difficult to overcome in the short (or even intermediate) run. I suspect that the future of publishing and the formats in which book publishing takes place is going to be more complicated than either you or I envision. I profoundly disagree with most of these points–aside from 6, 7, and 8, which is the primary reason I love ebooks, and make them. no one thinks that online publishing will not eventually overtake the traditional, hold-in-your-hand, made-of-dead-trees model</blockquote. Most of those of us who create ebooks and have been creating, publishing and selling them for more than twenty years think that certain kinds of books will remain in printed codex form. It is a durable archival quality media, unlike the digital file, and it doesn't require an external power source, and it works pretty much everywhere. It's a completely de-bugged technology. Electricity is a non-renewable resource; paper can be almost endlessly re-used, and trees are renewable and provide a variety of side benefits. But text can be consumed as easily from a screen as from the page. </quote. We read differently and browse differently in a printed book than the ways we read from the screen; it is a different experience, neither better nor worse–but different. There are, moreover, large numbers who have difficulty with LCDs, and eInk. The old model of handing someone a thing in return for money does not translate well in the world of electronic publishing.</blockquote. Sure it does; and information does not want to be free. My knowledge is valuable; I see no reason why I shouldn't be paid for it, and my abilities–and my writing. I suggest that anyone chanting "information wants to be free" needs badly to read The Cluetrain Manifesto. Figs don’t want to be free; information is a good. You think bards and scops worked for free? The addition of community to the text creates powerful marketing possibilities. I hope you don’t intend your view of community to be as exploitative as it sounds. Community is not about marketing. There’s a reason we have concepts like link whoring, drive-by posting, and trolling. Yeah I’ll totally switch from my no batteries required paper book to another power hungry device. The last two paperbacks I read at the pool fell apart within minutes from the heat and are now held together with rubberbands (I rarely throw away books). I’m ready for my Kindle now please. As a writer, I welcome a new form to share my work. I am also concerned for the environment. However, electronic devises are here to stay unless some super disaster erases the ability for mankind to make them. I am in favor of technology giving everyone an affordable way to produce their own, renewable electricity. (Wind power, solar power, do you live by a river? water power. )We can do it, make the HOA’s and city governments let us do it. In the end, I look forward when I can finish my edits and publish my book online. Happy reading anyway you can. Information wants to be free? Information is a domestic animal, the product of generations of selective breeding, that makes a mad dash at every opportunity to escape its pen, but will quickly die in the wild… I am all for the free distribution of broad classes of information (especially that created at public expense), but at the same time argue that any sustainable model of electronic publishing needs to account for the economic of producing and maintaining content. As someone who has always loved to read, and who loves books, I really really hope that I’m dead and buried before ebooks supplant written works. As a supplement, as a way to take books on vacation or read in bed late at night, fine. I own a fair number myself. But not any books I truly care about. Any book I truly care about, I will own in physical form. I’d note also, that the whole I can self-publish electronically is leading to the same thing that’s happening with music. Being buried under an avalanche of mediocrity. Only with the book, there’s never a live performance to give a hint as to how the written work will pan out. From an end user perspective, there are major disadvantages to the elctronic format. How do I borrow/ lend them out? Considering that this was how I got into my original genre reading kick, & that I like lending out my books to family & friends, it’s a pretty large problem. What about the second hand market? How do I go about getting rid of those older books that have no re-read value for me? While I see the convenience value in e-books, I don’t see them being as easily adopted as the original writer does considering that it’s dependent on the buyer accepting less control & ownership over his purchases. However, should there be sufficient economic incentive (ebooks that are significantly cheaper then paperbacks), that threshold might be crossed. This article does not take into account the real cost of an eBook reader device. They are undoubtedly more environmentally destructive than traditional paperbacks. Where does the screen come from? What powers the factories that makes those screens? Or the plastic casing? What happens to all those un-biodegradables when the bored eBook reader gets the urge to upgrade to the next new shiny toy after 12 or 18 months? What about the batteries? Do they grow in the ground? Where does the energy come to run all these millions of devices? Give every current paperback reader in the world an eBook reader and we’ll be having BP disasters a few times a year as we struggle to keep up with the demand. Making the equation “tree-eating books versus small, eco-friendly eBook reader” is simplifying the argument to criminal levels. My prediction? eBook readers will have their time in the sun, for the next decade or so, before we realise it was a dumb move and we should actually go back to the far less damaging paper model because trees can be grown and paper can be recycled. Wow, an intelligent acknowledgment of the obvious and inevitable. Nice article. Now for the harder part – getting a writer’s guild to acknowledge e-book publishers as “professional”. Guess that should only take a few more years, eh? This, and beginning and end of your thought #8 conjure forth the nightmare scenario of realtime fiction editing by committee. Think Twilight+Wikipedia+Myspace all in one. An author releases a book, which a fanbase immediately begins to collectively fact check and line edit. Those small edits eventually become changes in conversations, paragraphs, and entire rewrites of chapters. Texts are no longer the author’s in any meaningful sense. What would Hamlet look like after 500 years if it had initially been released to a public with iPads? It certainly wouldn’t still be Shakespeare’s original words. This million-monkeys approach will no longer require human authors. There are already algorithms that can write grammatically correct sentences if all we care about is maximizing permutations. I don’t believe I will be swapping my paperbacks, which can be made easily from inexpensive recycled paper and use a renewable and valuable to the planet resource in trees) with an electronic device that is power-hungry and eco-unfriendly in its requirements. It is not that I am opposed to e-books in principle, but it is not yet a viable long-term solution as it is often touted to be. Make it environmentally friendly, find a sustainable energy source (solar power might be a place to start), figure out how to not only secure an author’s work but PRESERVE and maintain it (after all, print survives for hundreds of years, e-technology can be obsolete and/or lost in a matter of seconds) then we’ll talk. There’s one thing that’s not mentioned here about the changes in publishing due to the emergence of the Internet and epublishing and that’s the change in the content provider. The fact that this author spends time talking about marketing reveals something. Authors are now expected to market their product. Authors must think in terms of marketing. That’s different. Not all writers can do that well, but the new cream of the crop are going to be the ones that can. What will that mean for literature? Will it change? Probably, but we won’t notice it changing. In a hundred years fiction will be totally market driven. I mean, worse than it is now, heh, heh. Will literary fiction be gone? What will happen to the experimental esoteric stuff? Will everything be like Hollywood movies? Sure, there’ll be some backwater site on the Internet, a shelf, say, for the strange stuff. But because you can find people to read anything on the Internet, will authors be tempted to spend more time in social media trying to get readers for their strange stuff, or will they do what they’re supposed to do: put out more strange stuff? This is a fantastic piece. It intrigues me that there is still a strong fear response among some readers, despite this clear explanation. I wonder who was frightened by the Gutenberg press? I’m sure someone was. Cat, amazing job – but I’m going to ask for some back up for the assertion that textbooks are going away first, or fast. I’ve been asking students if they want to use e-readers or laptops and they don’t. I don’t allow students to NOT buy texts, and to my knowledge, students most-using e-texts are seeking to get them for free. What I teach people to do cannot, right now, be done on an e-reader. Also, I’ve read quite a bit of recent research that people who are tech-savvy or involved with new media greatly overestimate the desire of others who aren’t as involved to adopt and use gadgets. Computers, the internet, e-texts and extremely varied multimedia content, including games, have been in our schools for 20 years. It might behoove to wonder – if it’s such a good replacement for paper texts, why do test scores continue to decline, and why do my students, 80 to 90 percent of whom come into class disliking reading, get “the reading experience” out of their physical books? I have a Kindle . . . I really liked it at Christmas – I couldn’t get over how cool it was. Now that the novelty has worn off, I’ve read 3-4 trade paper or hardcover books for every Kindle book I’ve downloaded and read. I’ve found that I am CHEAPER with Kindle books, so that should be looked-at in any marketing efforts. You might get me to pay full price, even for a hardcover, if it was a book I really wanted. But I find myself thinking a lot more about paying for the Kindle download than I would if I were browsing in the real store. This is the current link for the text that I use. There’s an online supplemental website that the instructor can choose to direct the students to, and use for tests, research instruction, etc. This is the most-adopted, or right near the top, college rhetoric text. There is no eBook option or edition. I am pretty sure textbook manufacturers don’t want that stuff out in the wild, with the existing phenomenon of used books that they see as an “enemy.” I’ve been offered options for personal text creation for at least a decade or longer – via POD, via CD, via the internet. I don’t take it and know only 1 or 2 instructors who do. It was heavily promoted 6-7 years ago, but much less-common now. I’ve discussed with others in the SFWA realm that they feel that “education” (and “information”) is free – but they don’t understand a vital part of what I and every other strong teacher does, and how the best learning outcomes are achieved. It involves physical interaction that currently cannot be done via any e-reader or computer screen. It involves putting the hand on the page, marking the page, underlining, highlighting, annotating. You get a lot less out of reading via an e-reader or, in something most people dislike, reading any amount of text online. e-Library and others have been available for years and they are highly useful for targeted research – and still, I know no one who READS all of any of those – they use the program to quickly locate the information needed in a research and writing process. As someone who’s trying to figure out how to make publishing work in that digital space, I appreciate most of what you’ve said here, Cat. I’ve been reading on screens for years now, and I do believe that we’ll see more and more people move into reading on e-devices. 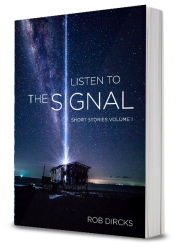 I’m frankly betting on it, having started a small business earlier this year to publish science fiction short stories exclusively in e-text and audio. Now, the argument was made earlier about the lowered bar bringing mediocrity. I hope that’s not the case. One thing about the internet is that everyone sees your rookie mistakes. But the people operating in this space will get better. The beauty of doing this as a startup and in electronic formats is that we can immediately make improvements in our delivery and our product without having to go through “existing inventory” before our customers – the readers – can see results. We can adjust our business model and try a lot of things. With persistence and effort, we’ll figure out how to bring great benefits to the reader AND to the authors as well (which will start with us raising what we pay as soon as we can afford to do so, and moving on from there). I think the next few years are going to see some interesting changes. The paper book is not going away – and considering that we grow trees specifically for paper, like any other crop, I think that’s actually pretty darn sustainable. But we will see more and more people taking advantage of the portability and convenience of reading on their e-devices.